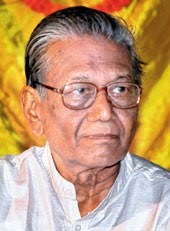 Staff Reporter: Eminent writer Manoj Das donated Rs. 10.45 lakh to Chief Minister’s Relief Fund which he had received as honorarium in his capacity as advisor for magazines published by scam-tainted Seashore Group. Seashore Sahitya Academy, the literary arm of the Seashore Group, had roped in the celebrated writer as an advisor to publish ‘Sita Sakala’ and ‘Sahitya Pruthivi’. “I was helping the group with monthly magazines. My sole aim was to promote the monthly magazine for adolescents in Odisha,” the Pondichery-based writer said over phone on Monday. Meanwhile, the Special Chief Judicial Magistrate (CBI) allowed the CBI to take the Chairman and Managing Director and two directors of Nabadiganta Financial Services on six days’ remand. Following the unsavoury revelations about the Seashore Group in the course of the ongoing CBI investigation into the mega chit fund scam in Odisha, Jnanapeeth award winning writer Manoj Das has donated the honorarium of Rs 10 lakhs he had received from the company to the Chief Minister’s Relief Fund (CMRF). Das was the advisor of Sahitya Patrika, a monthly Odia literary magazine, and Kishora Patrika, a monthly Odia magazine for teenagers, published by the Seashore publications division. Apart from contributing articles, he was in-charge of planning the contents of the two magazines, for which the company had paid him a monthly honorarium of Rs 1 lakh for some months. Besides, the company had also paid a monthly honorarium of Rs 5,000 to the assistant of Das for nine months. After the involvement of the company in the chit fund scam came to light, a columnist had recently sought a clarification from Das as to how he was receiving the money from the company. Besides, a blog in the Facebook had also alleged that the Seashore was giving Das an honorarium of Rs 1 lakh to use his name once a month. Distraught over these allegations, Das has given the media details of the circumstances leading to his involvement in the two magazines. Besides, he has also donated the total honorarium to the CMRF. Taking note of the unsavoury revelations about the Seashore Group of Companies in the course of the ongoing CBI investigation into the mega chit fund scam in Odisha, eminent Indian writer Manoj Das has donated the honorarium of Rs 10 lakh he received from the company to the Chief Minister’s Relief Fund (CMRF). Manoj Das Das was the advisor of Sahitya Patrika, a monthly Odia magazine and Kishora Patrika, a monthly Odia magazine for teenagers, published by the Seashore publications division. Apart from contributing articles, he was in charge of planning the contents of these two magazines for which the company had paid him a monthly honorarium of Rs 1 lakh for some months. Besides, the company had also paid a monthly honorarium of Rs 5, 000 to the assistant of Das for nine months. After the involvement of the company in the mega chit fund scam came to light, a columnist had recently sought a clarification from Das as to how he was receiving the money from the company. Besides, a blog in the facebook had also alleged that the Seashore was giving Das an honorarium of Rs 1 lakh to use his name once a month. Distraught over these allegations, Das has given the media details of the circumstances leading to his involvement in these two magazines. Besides, he has also donated the total honorarium to the CMRF.